Make no mistake about it. 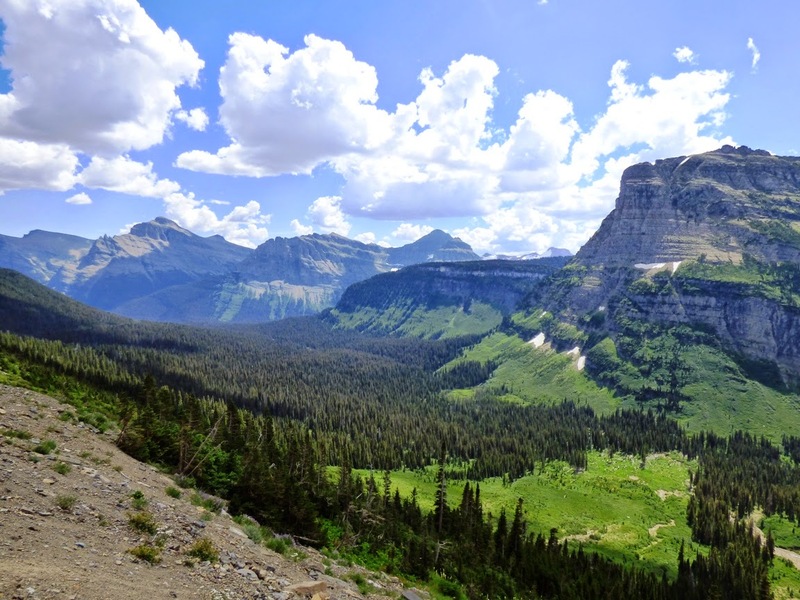 Glacier National Park is one of the most spectacular parks in the United States, and indeed is one of my favorite places on planet Earth. That said, it's losing something important, and the change is profound. How many animals are in this picture? When I was a child, I loved museums, but I knew there was a big difference between seeing a stuffed animal in a quiet exhibit hall versus seeing one in the wild. A living, breathing animal trumps a stuffed one every time, especially if said animal is capable of killing you! And that's my problem with what's happening in Glacier National Park. It's hard to put a glacier in a museum. In 1850, there were around 150 glaciers within the park boundaries. Today there are only 25. And they will be gone soon, probably by 2030. The sights we've been enjoying over the years with our visits to Glacier are disappearing at a rate that is heart-breaking. Of all of the signs of climate change, the loss of glaciers is the most vivid. 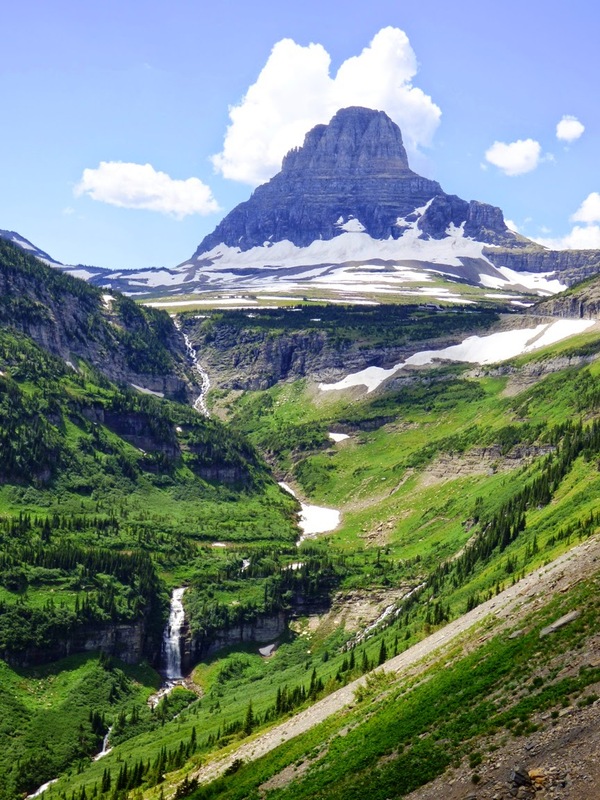 Glacier will always be a beautiful park, and I will keep going back for as long as I am able, but it will soon stand as a monument to glaciation rather than a place where one can experience glaciers. And that is a shame. The changes will go beyond just the loss of glacial ice and scenery. The balance of river flows will change, both in the patterns of volume, but also temperature. 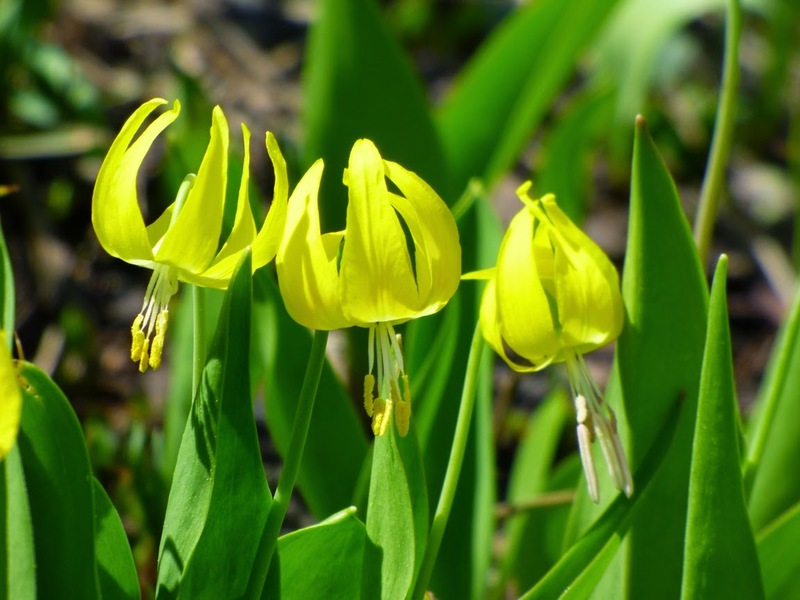 Some native species depend on the year-round cold flows that emanate from glaciers. Some streams without a glacier at the source will be drying up before the next winter comes around. 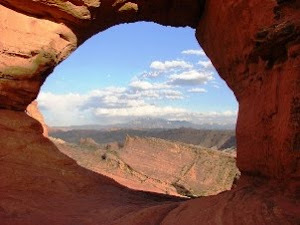 Habitats of all animals will be driven to higher elevations, and those at the higher altitudes in the park may find themselves without any habitat at all. We are already seeing the kinds of devastation wrought by pine borer beetles in Colorado and Wyoming. Devastating wildfires have already affected large parts of the park. We are now living the predicted changes in our global climate. 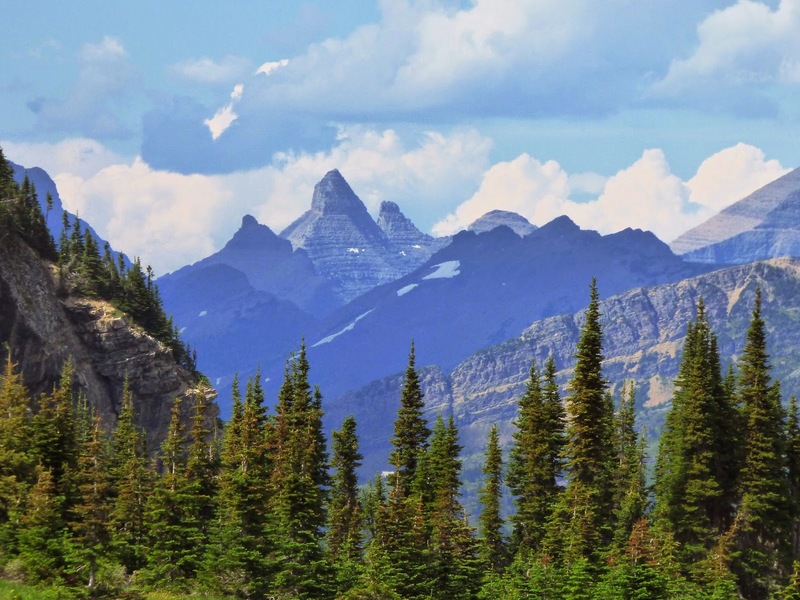 The primary purpose of our trip was an exploration of Canada, so our visit to Glacier National Park was a short one as we drove west. We usually stay two nights and spend some time on the trails. 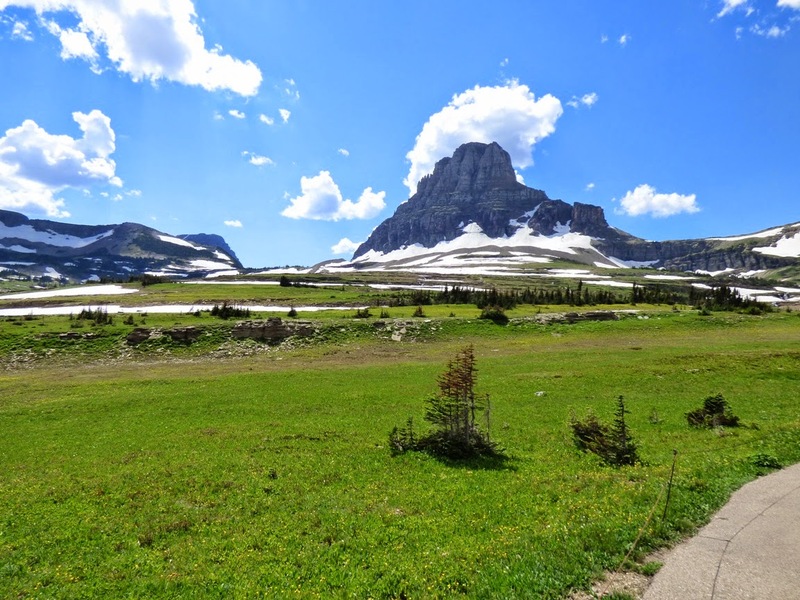 We traveled along the spectacular Going to the Sun Highway over Logan Pass, and spent several hours exploring the alpine meadows above the pass. As every climatologist will tell you, there is a big difference between climate and weather. Weather is the day-to-day conditions outside ("It's cold outside") whereas climate is the long-term patterns of temperature and precipitation. Climate changes slowly over time while weather happens daily. Yet it is hard not to notice the daily extremes. When we climbed out of our vehicles at Logan Pass (6,647 feet; 2026 meters) it was 86 degrees. We were surrounded by rapidly melting snowbanks, and it was uncomfortable 86 degrees. 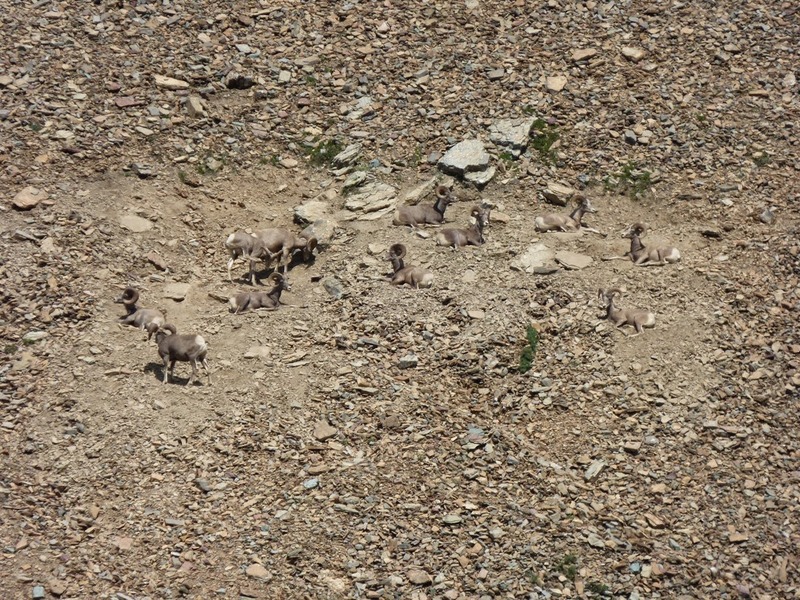 The herd of Bighorn Sheep noticed. Some of them were laying in the snow to keep cool. 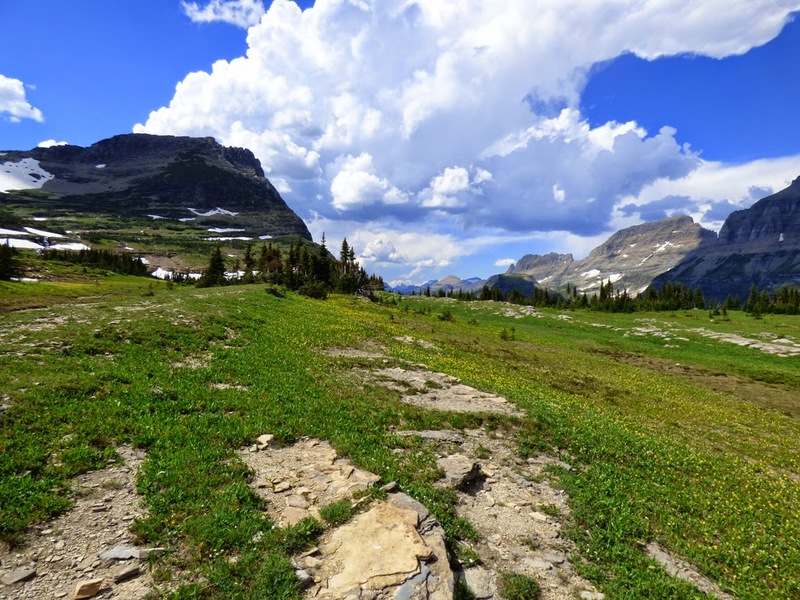 The geologic story of Glacier National Park bears some resemblance to that of Banff and Yoho National Parks in Canada, but there are big differences as well. Like the Canadian Rockies, large blocks of sedimentary rocks have been thrust eastward over softer Cretaceous rocks of the High Plains. Unlike the Canadian parks, the rocks at Glacier are older, closer to a billion years of age (Banff and Yoho sediments are around 500 million years old). They are part of a sequence of rocks called the Belt Series. They contain fossils, but they are of algal deposits called stromatolites. Multicelled creatures did not yet exist. 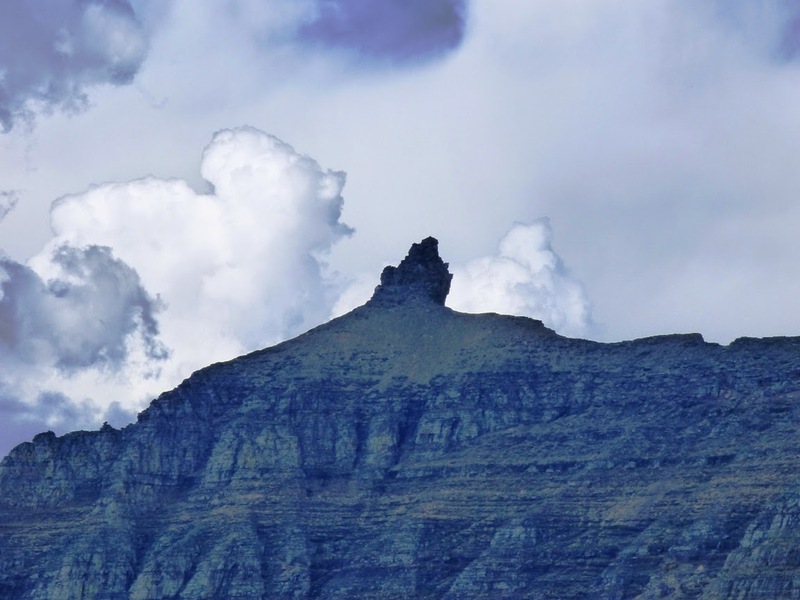 The peaks were high enough to stand above the vast continental ice sheets that covered the adjacent plains. 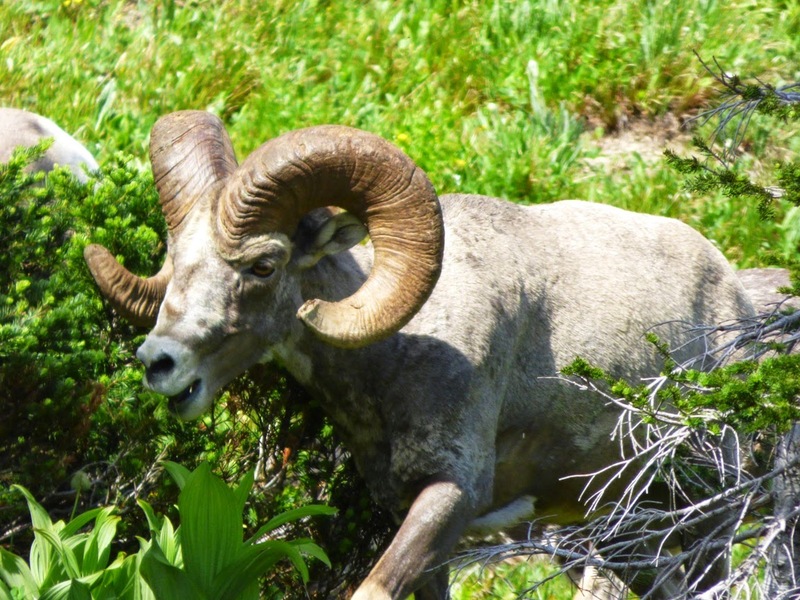 The glaciers plucked and abraded the flanks of the high peaks, leaving behind outstanding examples of horns, aretes, and cirques. But unfortunately, many of the banks of ice are no longer considered glaciers, as they have shrunk and stagnated. When the chunks of ice no longer move, they aren't glaciers anymore. 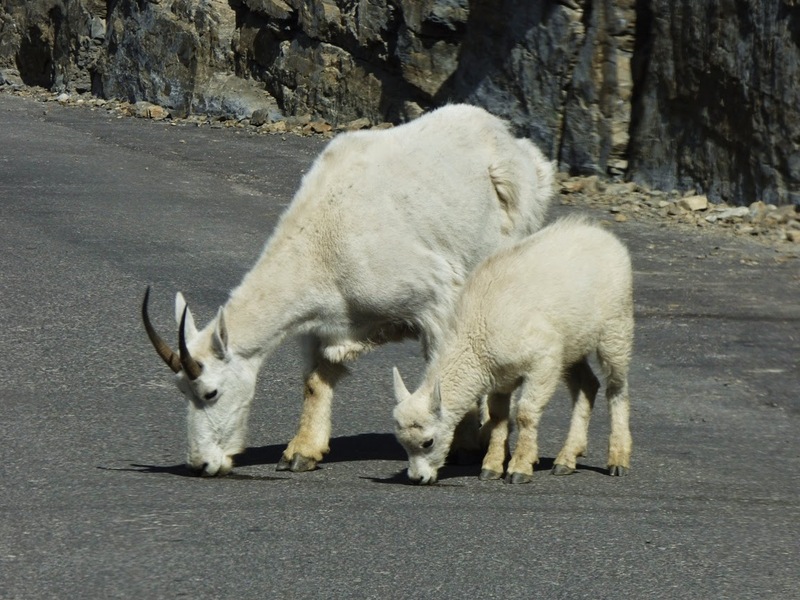 We headed down the incredible west side of the Going to the Sun Highway very slowly, both to avoid plummeting to our deaths down the steep cliffs, but also to avoid running into the beautiful Rocky Mountain Goats who were licking up salt off the roadway. 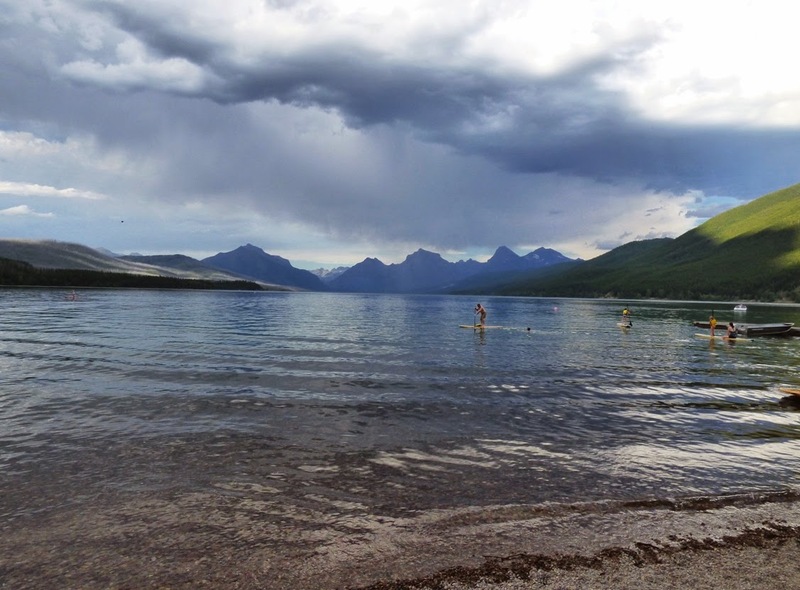 We reached beautiful Lake McDonald, had a last look at the high glaciated peaks, and then headed west to Kalispell to our hotel. 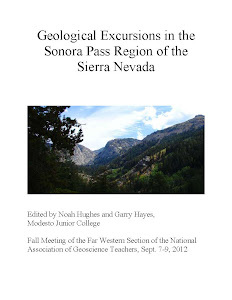 We would be making our way to Washington the next day on our way home. The Northern Convergence tour was reaching the final stages, but there was still much to be seen on the road ahead! Lake McDonald at the west end of the Going to the Sun Highway.